MOORESTOWN, NJ, MAY 17, 2018 – Weiler Labeling Systems (WLS), a ProMach product brand, introduces the new VCV Fiber Laser Vial Coder. 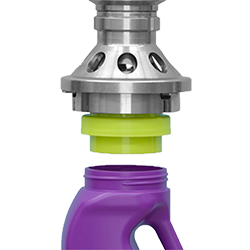 Designed to handle unlabeled vials from 5 to 500 cc in size, this rotary system accurately marks the aluminum crimp area of the cap with a product code and time stamp at speeds of 150 vials per minute and above. By ‘bright stock’ labeling vials, the VCV Fiber Laser Vial Coder helps product manufacturers and contract packers positively identify unlabeled products in storage and throughout the supply chain for improved traceability while maximizing production efficiencies. The VCV Fiber Laser Vial Coder is ideal for pharmaceutical, biotech and veterinary products in vials or cartridges with aluminum crimps. Print location accuracy is critical when marking the 4 mm-tall crimp area with a code that is 2 to 2.5 mm square on glass vials that often vary in height. Adding to the challenge, a fiber laser requires a very repeatable focal distance. The VCV Fiber Laser Vial Coder achieves extreme positional accuracy with vacuum pockets that securely hold vials in the star wheel while minimizing vibration. A camera identifies the exact location of each vial’s crimp area and a servomotor-driven slide-mounted laser adjusts to each vial’s height for marking. After being marked, a slide-mounted camera inspects the code for readability and accuracy, and any improperly coded vials are automatically tracked and rejected. This system marks the aluminum crimp area of vials with a 2D data matrix code, including a time stamp, with a fiber laser from Domino. It can be used to mark other variable data such as a serialized code. The VCV Fiber Laser Vial Coder helps maximize production efficiencies and flexibility by ‘bright stock’ labeling products that are awaiting their final labels. This packaging method enables manufacturers and packers to consolidate operations, produce larger batch sizes and handle unlabeled products to meet the needs of various country markets and global customers. 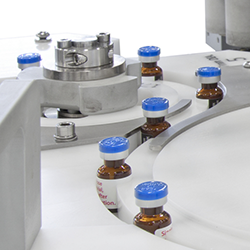 Compared to labeling shrink wrapped trays of unmarked vials, coding individual vials ensures proper product identification and traceability during storage and throughout the supply chain. 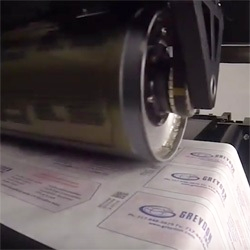 Unlike inkjet printing, marking with lasers eliminates consumables and provides a more durable code. Continuous-motion handling, printing and inspection enables the VCV Fiber Laser Vial Coder to mark 150 containers per minute or more, depending on the application. It can be changed over to handle vials from 5 to 500 cc in size in less than 5 minutes, with no tools required. Servomotors on the star wheel, print head and camera ensure easy changeovers with recipe settings, which are stored in memory for easy recall via the intuitive touchscreen control panel. An Ethernet port enables the VCV to be connected to a plant wide network for data collection, reporting and remote diagnostics. The compact system is Class 1 guarded to ensure worker safety. With cGMP compliant construction, a stainless steel clad base and heavy-duty components, the reliable VCV is built to meet the most demanding needs of the pharmaceutical and medical device industries. WLS supports their equipment with an industry-leading warranty and world-class technical service. 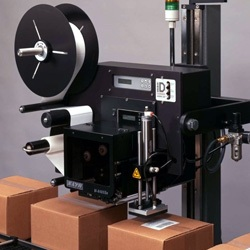 Weiler Labeling Systems is an industry-leading designer and manufacturer of high-speed rotary labeling machines and serialization and coding solutions for the pharmaceutical and medical packaging markets as well as the food, beverage, personal care, and consumer markets. With nearly three decades of experience in providing labeling, coding, inspection, and precision-manufactured systems, WLS is at the forefront of delivering customized solutions backed by a culture of unwavering customer care. As part of the ProMach Pharma business line, WLS helps our packaging customers protect and grow the reputation and trust of their consumers. ProMach is performance, and the proof is in every package. Learn more about WLS at www.WeilerLS.com and more about ProMach at ProMachBuilt.com.